Only two colors can be achieved by a printer that uses only 1 bit. An older black and white printer could either use black or white, but did not have any shades of gray. When 8-bit color came along it could display 256 different colors to create an image, 16-bit color can display 65,536 colors and was the standard for many years for display monitors. Color images require more bits to accurately “describe” the color for a display or a printer. For example, the “True Color” 24-bit depth used by many modern operating systems 256 shades of blue, red and green, creating 16,777,216 internal color variations. With this amount of color tones available, photographs and graphics will be vivid and nearly an exact match to an original image with smoother gradients and transitions between colors. True Color is so named because it can display so many colors it provides a true representation of the original subject for the human eye. 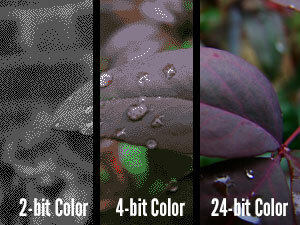 Higher bit depths such as 36 and 48-bit are now available, providing even more accurate color rendering. Do I Need High Bit Depths? While higher bit depths for images have their advantages, the disadvantage is in larger file sizes. This can take up more space on a digital camera or hard drive, and cause slower loading and editing times when handling digital photos. Since printers often can’t accurately transfer the same number of colors to the page, this can seem like a waste of time and space. There are still good reasons to choose higher depths, however, especially for photos. When editing a photo, the higher the bit depth, the more you have to work with when doing color correction, adding filters, and more. Once you reduce the bit depth, you can never get that information back. The best method for balancing the advantages and disadvantages of bit depth is to choose the one that fits your task. When scanning text documents, for example, choose a grayscale or black and white mode, which reduces the bit depth, and therefore the size of the file. Scanning in full-color when a document is only monochrome is simply using unnecessary bits. When scanning a full-color photo, choose the 24-bit setting or higher (sometimes called “photo mode”) to make sure it displays well on your monitor and in prints. These settings often also modify the printer resolution, which will be important when printing later. Giving the printer a lot of detail to work with means it can make a better conversion to the page, but bit depths higher than 24-bit won’t likely produce noticeable improvement. A printer uses toner and ink in a CMYK configuration that is different than the RGB system of most displays, so this conversion is important. By understanding bit depths and the effect they have on your media, you can make a more informed choose when working with photos and documents. Using the right depth at the right time can save time and storage space, and produce the best quality output.